Just north of Los Angeles lies the Palos Verdes Peninsula jutting out into the Pacific. 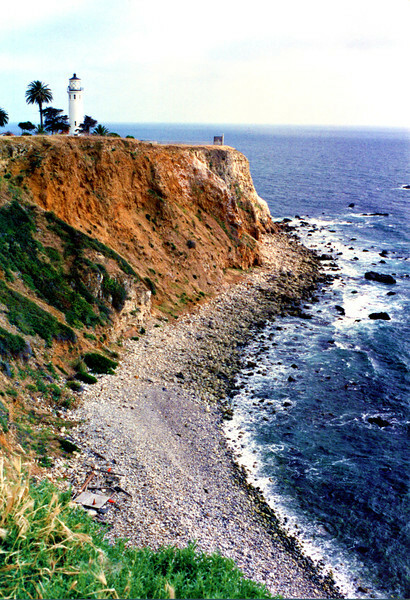 At the end of the peninsula Point Vicente marks the northern entrance to the Catalina Channel and San Pedro and Long Beach Harbors. The point is also a navigational hazard in foggy weather. At the beginning of the 20th century there was an unlighted gap of 32 miles between Point Hueneme Light to the north and the Point Fermin Light to the south. With the opening of the Panama Canal and the associated increase in shipping, maritime interests clamored for additional aids long this length of coastline. In 1914 the Lighthouse Service requested funds to build a lighthouse and fog signal station at Point Vicente. In 1916 Congress appropriated $80,000 for the project. Delays in acquiring the land led the Service to threaten the owners with condemnation proceedings. A deed was finally secured in 1921.